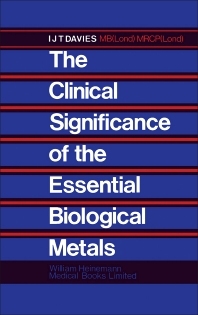 The Clinical Significance of the Essential Biological Metals covers the six trace minerals necessary for human survival,namely zinc, copper, manganese, molybdenum, chromium, and cobalt. This book contains seven chapters that specifically discuss the effects of these minerals for enzyme function, protein synthesis, and their nutritional significance in veterinary and agricultural practice. Some of the topics covered in the book are the importance of interactions between the essential biological metals; importance of fertilizers; analysis of water supply, soil mineral content, and cancer mortality; influence of drinking water on atherosclerosis; non-essential but biologically important metals; and absorption and availability of zinc. Other chapters deal with the factors influencing absorption of zinc, the effects of copper on zinc availability, and the form and absorption of copper in the diet. A chapter is devoted to the role of lymphatics in copper absorption. Another chapter focuses on the distribution, absorption, and transport of manganese in the blood. The book can provide useful information to doctors, biochemists, nutritionists, students, and researchers.